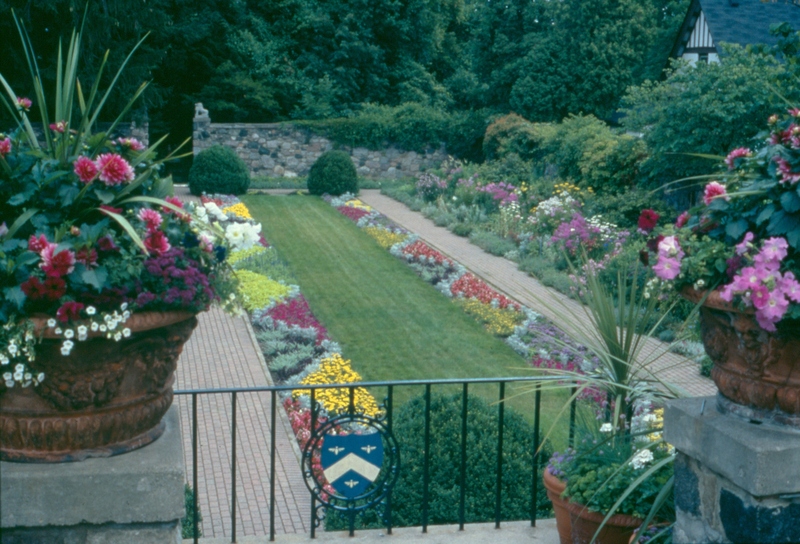 As a part of Cranbrook Archives architectural slide collection*, this image shows Cranbrook House’s sunken garden in full bloom in 2003. If you’re in the area, be sure to stop by the gardens this summer – with new patterns and plants, they are in full bloom and open for visitors! The sunken garden at Cranbrook House in full bloom, 2003. Balthazar Korab, Cranbrook Archives. *If the colors of the photo appear slightly off to you, don’t worry – that’s just because we scanned the image directly from the slide, which has a different coloration than a digital photograph would. We considered correcting it, but we enjoy seeing the indication of historic photographic processes and we figured you would too! It has been a crazy few weeks at the Cranbrook Center for Collections and Research – we mounted our two exhibitions at the Cranbrook Art Museum and helped CAM celebrate the opening of the summer museum season with the blockbuster Michigan Modern show. What that means now is that we’ve all got celebratory parties and vacation on the brain, and what better way to celebrate a museum success than with evidence of the parties of the past? “Come as a Song” party, 1942. Cranbrook Archives. 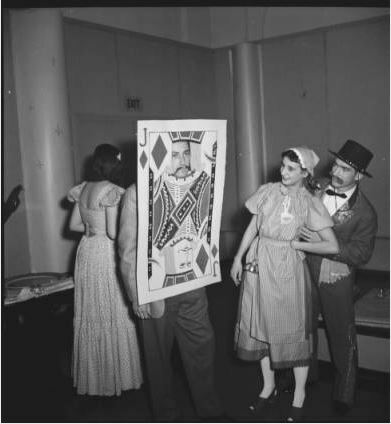 This photo, taken in March of 1942, captures Harry Bertoia (far right) and Brigitta Valentiner (middle) with an unidentified student (left, and conveniently marked by a Joker card costume). These three costumed young people are attending the “Come as a Song” party, one of the many themed get-togethers hosted at the Academy in the mid-century period. Harry Bertoia, of course, went on to become a sculptor and furniture designer. Two years after this photo was taken, Harry and Brigitta Valentiner, dressed here as a young maid, married. A Detroit native and a published author, Valentiner was the daughter of Wilhelm Valentiner, the Detroit Institute of Art’s legendary director from 1924 to 1945. 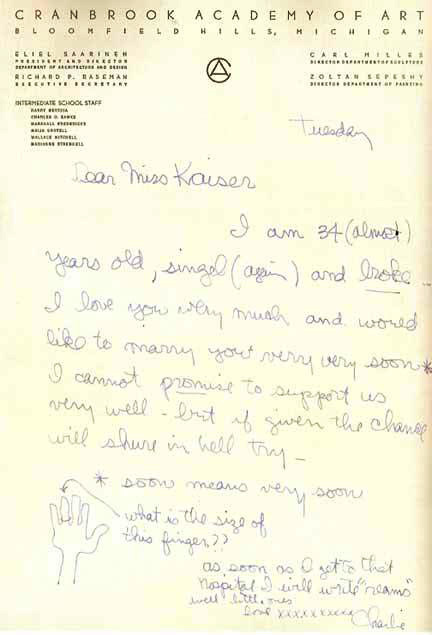 Cranbrook Academy of Art stationary has witnessed some very interesting correspondences, but we’ve yet to see anything more adorable than this: Charles Eames’ 1941 marriage proposal to Ray Kaiser, delivered on CAA letterhead. Charles and Ray met at Cranbrook, of course, and moved from Michigan to Los Angeles after their marriage. We can’t take credit for the object or the article about it – that goes to the Library of Congress and Maria Popova at brainpickings.org respectively. Still, there is something lovely about seeing a bit of Cranbrook play a role in this legendary design – and romantic – partnership. From the Archives: Teaching and Exhibiting Painting at Cranbrook, 1930-1970, photograph courtesy of Justine Tobiasz. With the opening of the summer exhibition season at the Cranbrook Art Museum, the campus is filled with opportunities to learn about art, design, and history. This also marks the first of a regular series of exhibitions that explore the unplumbed depths of Cranbrook’s archival holdings. From the Archives: Teaching and Exhibiting Painting at Cranbrook, 1930-1970 highlights the efforts of Cranbrook teachers and curators and explores the work they did promoting painting at Cranbrook at the mid-century mark. Curated by Head Archivist Leslie S. Edwards, the show uncovers untold accounts about the moments and figures that populate Cranbrook’s storied painting history. 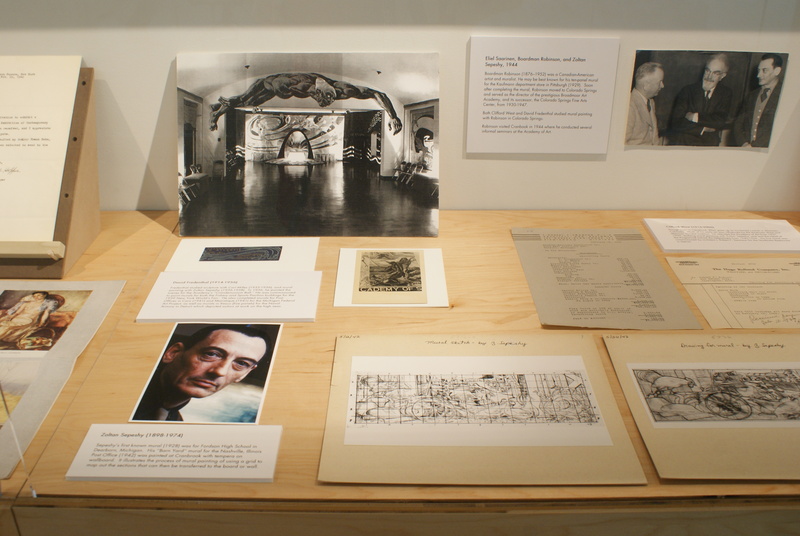 From the Archives: Teaching and Exhibiting Painting at Cranbrook, 1930-1970 will be on view in the Cranbrook Art Museum from June 14 to September 29, 2013, so be sure to check it out!